t have to fix up the place. So she can't explain why she bought it. She also can't explain what compels her to spend hours one night, digging in the basement until she unearths a man. A man who still lives and breathes despite having been buried alive. A man whose intense brown eyes glow amber with pain, declaring him far more than ordinary. Susan knows she should keep her distance. He has no memory and possesses gifts that would make most fear him. But as the two work together to unravel the mystery of his past, she finds herself drawn in by his teasing nature and tender touch. 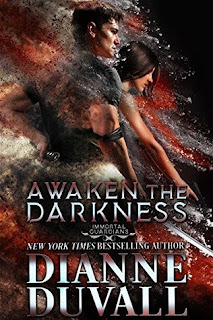 So much so that she loses her heart to him even as they find themselves hunted by unknown enemies who are ruthless in their quest to capture them. Yeah, we have another book in this series! And it was so great! And yeah that Stan is alive! We thought that he had died in Night Unbound, so that he's still alive, yeah, that was so great! I really enjoyed him and Susan! For this book, it was almost like Darkness Dawns again, because it's basically the two of them for the majority of the book, because he lost his memory. And so we didn't have the whole gang like in previous books, which was odd, but so great to read! One thing that I love about this book, is that it ties back to be Night Unbound with Stan, but it also ties back, rather unexpectedly, to Aimee. That Susan saw Ami's face when she was briefly kidnapped, yeah, that was an interesting detail. And Seth's explanation of his and David's clean up, it just really felt full circle, you know? I really enjoyed that ending! Yuri was Stan's mentor, his brother, and to know that Yuri is happy with Cat, yeah, that was a really sweet ending! It was pretty emotional, but it was also healing, and it made a great ending for this book! I loved reading this book, it was so wonderful, and I can't wait for more! Reason Why: Love this series and her writing, and it's a Prequel & Sequel Challenge 2018 Book!